Far from me the pretense of being a nature photographer: neither do I have all the necessary toys nor the patience to sit in vigil for hours. In fact I even passed on a night excursion to try to see the local croc: I was promised at best to see a pair of eyes gleaming in the dark. The Baba has become near extinction in the Delta as the natives and locals hunt it to eat (1). And yet, in spite of this negative inclination from my part, I was regaled with a spectacular display of wild life, sometimes all but posing for me. Several things are striking in the Delta when wildlife is concerned. First, there is going to be a scarcity of mammals relatively to other places. 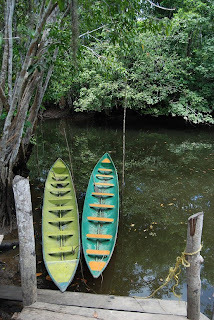 After all, it is swampy, it requires you to swim treacherous canals full of piranhas and other vermin. Favored mammals will be those living on trees rather than on ground since there is little dry ground available. Monkeys I saw, Araguato and Capuchins jumping from palm tree to palm tree, but no pic good enough to post. The only other mammal that I saw, besides the cats and dogs at one camp, was a real prize: the Boto, or fresh water dolphin. Unfortunately they were not pink, I only saw their shiny gray backs on occasion and it was impossible to take a picture. But I saw them. Neither did I see snakes. I looked into branches whenever we went through a small channel, or hoped to see some anaconda considering an attack on us, but no such luck. Snakes must have long ago learned to retreat as noisy motor boats approach. Thus the only option left were birds and greenery. I will pass on insects although I almost got cardiac arrest when I saw something that looked like a gigantic circular almost silvery roach like critter that had chosen for its night lodging the ankle folds of my pants. I did not kill it, you will know. Now I know why the natives keep everything hanging from the ceiling instead of neatly staked on a shelf. Greenery is of course your first vision when you reach the delta: a green wall everywhere. Nothing better to illustrate this than a tiny video shot. It was taken when we were exiting from a small creek. You can see at the end the much larger arm where it merges, with the tide current. Too many plants were spectacular. 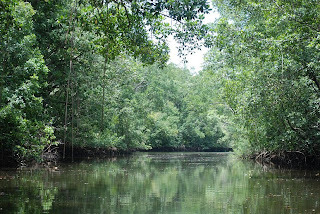 I will limit myself to three pictures, first the huge green walls that the mangrove offered for miles unbroken. 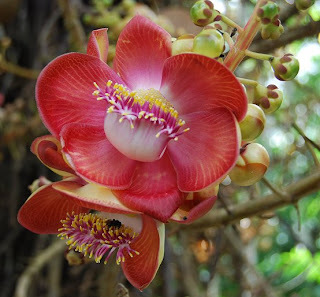 And this fabulous tree where fruit and flowers, with their very own special limb, sprout directly from the tree trunk at the same time. It also exists in Asia under the name of Buddha tree, I was told. The smell is not pleasant at all which explains why flies seem to be the pollinating agents as the flower pic shows. But the big excitement was looking for birds. Even though I am not a bird watcher, I could not fail but get increasingly excited at the perspective of our next bird sight. That a bird watcher carried her book in our small party did not hurt, of course. 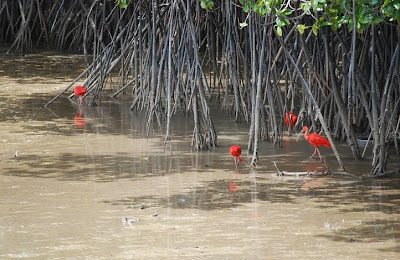 We saw: scarlet ibis until we got saturated; cocoi heron; cormorants; king fishers; tucans; white egrets; all sorts of little waddler birds; turkey vulture; some kind of eagle; little red necked cardinals; hoatzin; and more that I fail to remember now. One thing was shared by all of these birds: they were well fed, strong and little scared of humans. I mean, you certainly could not touch any of them but approaching by a few yards was often quite possible. Clearly, the Orinoco Delta is a good provider for many birds. I will add only three more pictures to this post as it is already long enough. The first one was a fantastic cormorant nesting area. 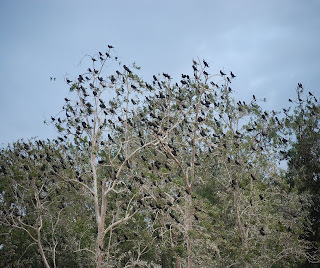 Since there is nothing rocky where to spend the night safely, cormorants nest at the tip of an island where they clutter an area of the mangrove, tearing all leaves and giving a strange silvery tone to the wood, courtesy of abundant guano formation. This picture was taken close to Pedernales, at one of the mouths of the Manamo. And while we are talking about nesting, check these nests hanging together (probably some "cacique" type of bird, we did not see any bird flying in or out). 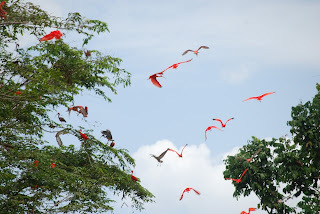 And to end, more scarlet ibis, in flight. 1) The baba is more current elsewhere and can even reproduce in captivity where it is bred for consumption. Thus it is not endangered. But in the wild of the Delta it is having a hard time when man comes close. At least that is what my competent guide explained to me.